Rumors of the demise of the SWGoH GameChangers have been greatly exaggerated. I am pleased to report today that the SWGoH GameChangers are back with the latest game updates and information set to descend upon Galaxy of Heroes. New content is always a hot item, and earlier this week we learned a bit more about the Emperor’s Shuttle which was first announced in the Road Ahead in late January. But the Emperor’s Shuttle is not the only topic for today as we can now report the first pieces of information for the new-look Separatist Droid faction that will dominate February 2019 in SWGoH. Final Text: Deal Physical damage to target enemy. If target was Target Locked, all Droid allies recover 5% of their leader’s Max Health and Protection. Description: B1 can’t score critical hits or be revived. B1 has no Protection, 1 Health and 20 stacks of Droid Battalion, and can’t be defeated or destroyed while they have Droid Battalion. When all stacks Droid Battalion expire, B1 immediately destroys itself. When B1 takes damage, they dispel all debuffs on themselves and lose 8 stacks of Droid Battalion. At the start of B1’s turn, they gain 3 stacks of Droid Battalion. Final Text: B1 can’t score critical hits or be revived. B1 has no Protection, 1 Health and 100 stacks of Droid Battalion, and can’t be defeated or destroyed while they have Droid Battalion. When all stacks of Droid Battalion expire, B1 immediately destroys itself. B1 is immune to Damage Over Time. Final Text: Deal Physical damage to target enemy. If target was Target Locked, inflict Critical Damage Down for 2 turns. Otherwise, inflict Target Lock for 2 turns. Final Text: Deal Physical damage to all enemies and dispel all positive status effects on them, with an 80% chance to also inflict Buff Immunity for 2 turns (applied before damage). Final Text: B2 has a 40% chance to gain 100% Turn Meter whenever another ally is evaded or damaged by an attack. Target Locked enemies have -25% Critical Chance and -25% Evasion. Final Text: B2 has a 40% chance to reduce its cooldowns by 1 whenever a Separatist ally is evaded or damaged by an attack. Whenever B2 inflicts a debuff, all other Separatist Droid allies gain 5% Turn Meter. Final Text: Dispel all debuffs from target Empire or Sith ally, then they recover 50% of their Max Health and Protection. Dispel all buffs from target enemy and inflict Buff Immunity on all Target Locked enemies for 2 turns. This ability starts on cooldown and can’t be evaded. Final Text: Dispel all debuffs on the Emperor’s Shuttle any time it takes damage from a Target Locked enemy. Empire and Sith allies gain Protection Up (20%) for 2 turns when critically hit, doubled to 40% for Empire or Sith allies that are Taunting. 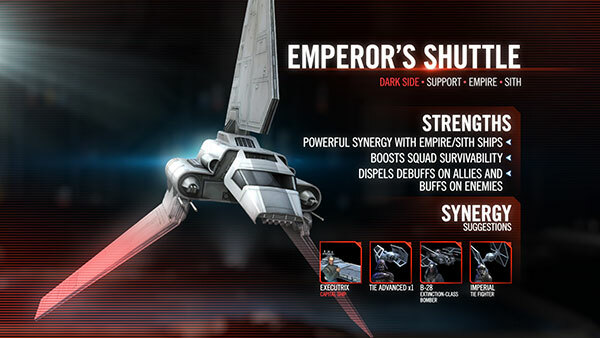 Final Text: Enter Battle: The Emperor’s Shuttle gains Protection Up (25%) and Critical Hit Immunity for 2 turns. Empire and Sith allies gain Offense Up for 2 turns. Inflict Tenacity Down on target enemy for 2 turns, which can’t be evaded or resisted. The Emperor’s Shuttle can use Emperor’s Influence immediately. Be the first to comment on "SWGoH GameChangers: Emperor’s Shuttle, B1 & B2 Battle Droid Kits Revealed"